As you can see from the photo above, everyone gets pretty excited around here when I actually get around to doing some home baking! I have recently found a few of the coolest recipe websites EVER and thought I'd share a few of them with you. This is one of my favourites... Jim's Pancakes. He inspired me to make pancake shapes with Miss 3 today. I love his creations. They Draw and Cook is another of my favourites. I'd love to print out every little drawn recipe and make a cute little recipe book full of them! Perfect for getting the kids excited about cooking. 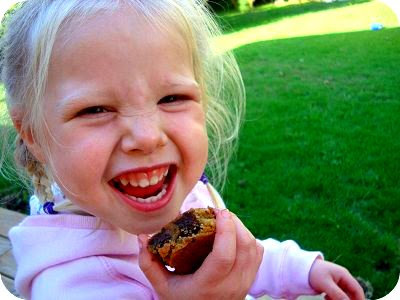 Be careful about clicking on this link people: "The Joy of Baking". I promise you will start to drool as soon as you see the delicious assortment of tried and true recipes. I really really really want to make a Red Velvet Cake one day! 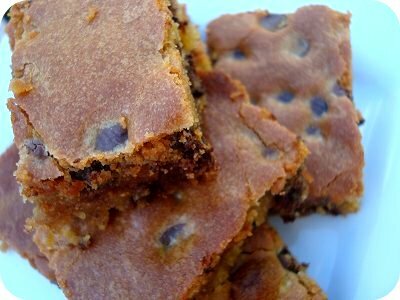 And the Congo Bars pictured above were found at Bakerella. The place to go for the cutest and tastiest baking ideas and treats. These bars are delicious and easy to make. Go here for the recipe! Mmmm... now I"m off for a run. Thanks for those links. What cool sites! that pancake one is amazing! A Ferris wheel!!?!? Yes yes yes you have to make Red Velvet Cake. I mean, what's not to like about cake with Cream Cheese Icing?? oh my goodness I have always wanted to try and to make a red velvet cake! delish!!! i will certainly be checking the recipe out! This is your invitation to follow my blog...or Not. oh you are such a naughty girl!!!! those bars DO look yummy!!! Thanks for sharing! How I love to bake, but have to work around doing it all in a toaster-oven...lol! Hope you're having such a blessed and great week! !